From a recent survey by business insider, an interesting comparison of overall costs by state – including premiums and average deductibles and expenses. Costs continue to rise faster than wages. 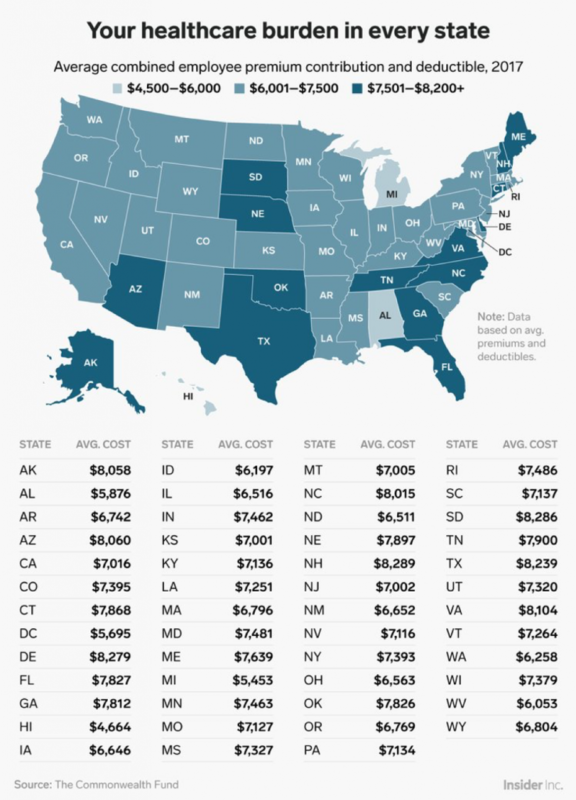 Interestingly, the state with the highest average income (NEw Hampshire) also has the highest costs- $8,289 per person per year. How did your state fare? More from the report: “Enrollees in short-term plans say they are satisfied with the benefits they receive, although relatively few people actually try to use them. “Sixty-nine percent said their short-term plans offer coverage for the benefits they value most, yet only 23 percent of enrollees actually received medical care while covered by a short-term plan. “Of those enrollees, 54 percent made a sick visit to a doctor, and 43 percent received preventive care. Only 25 percent purchased prescription drugs, and 12 percent made an ED visit. Only two percent engaged in a hospital outpatient visit and 8 percent required surgery or other serious care. “Among consumers who received care, 43 percent said they were very satisfied with the results. Long Term Care Policies in trouble? Several events this past week are concerning about the financial viability of Long Term Care Policies. In South Carolina, rate increases filed with the department of insurance last week requested between 143%-259%. The Director of the insurance department turned down those increases, which leads to the second event. In New York, Genworth (the largest writer in the past few years of LTC) announced, after their rate increases were declined, they are halting all new sales in the state. Note that existing clients will still be serviced. “General Electric Co is setting aside one of the largest amounts ever to cover potential losses on policies that provide long-term care in nursing facilities and patients’ homes. But insurance experts are concerned that may not be enough. “For comparison, Humana Inc has set aside $77,282 per policy, while Unum Group has set aside $10,614, Audit Analytics said. Can selling across state lines work? The Washington Post reports that “The Trump administration is seeking ways to allow more health insurance plans to be sold across state lines — an effort that could involve implementing a part of the Affordable Care Act the Obama administration left untouched. The problem, IMHO, is two-fold. Rates vary state to state because different states have different mandated benefits, the people in their pool have varying levels of health, and the costs for healthcare vary greatly state to state. As an example, a hernia repair in Iowa averages $6900, while in NY it is 15% higher at $7900. Would your insurance bought in another state pay the local usual and customary rate? if so you will have $1000 uncovered, and MD’s might drop the plan due to lower reimbursement rates. OR would they pay the higher rate, therefore having to raise the premiums to cover these higher costs? And if the rates all rise to meet the more expensive costs of healthcare, what have we accomplished? This is a very complicated topic, and sound bites on the nightly news are not solutions. Our system remains badly broken and in need of a comprehensive solution – one that actually controls costs, doesn’t drive physicians away, provides americans with access to care, and at a reasonable cost.